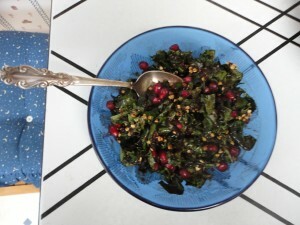 With all this pomegranate love going on, I thought maybe I better share my decadent update on my morning kale and fruit salad, before the very last of the pomegranates disappear for the year. I call it decadent because it tastes so darn good–as near to a chewy chocolate bar as I can safely come–but it’s actually quite healthy. I think it was Chef AJ who, in talking about eating kale for breakfast, said over on Healthy Girl’s Kitchen that “If I’m not hungry enough to eat kale, then I can’t really be that hungry.” I’m paraphrasing, but it went something like that, and made good sense to me. If you’re seriously trying to lose weight, some of the ingredients, like the dried fruit and fruit spread, might be a bit too much on a regular basis. You can change up this dark and delicious dressing to suit your own needs. And if you can do chocolate, sub out the carob powder with cocoa powder. But I tell you, the carob powder is wonderful in this, and doesn’t leave me wishing for anything else. 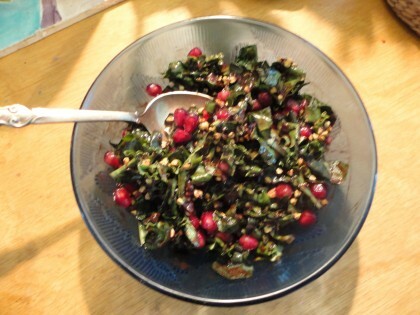 So here’s my jewel of a late Fall early Winter breakfast salad, with a nod to Gena at Choosing Raw blog and Chef AJ, for the inspiration to come up with it. 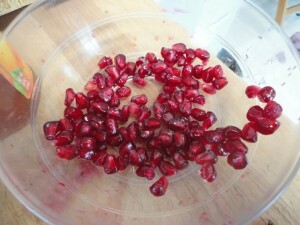 And once pomegranate season is over, you can experiment with any other dark–or light– fruity sparkle you like. Pears would be great. And blueberries too. Currants. Raspberries. Persimmon. Apple. . . Put all the dressing ingredients in the bottom of your cereal sized bowl and mash together well with a fork, until you have a thick dark “chocolaty” looking sauce. Remove the kale leaves from their stems and squish them up in your hands to soften (a quickie massage! ), then chop up and put in the bowl on top of the dressing. Add the buckwheat groats and pieces of chopped dried fruit if using. Now here’s the “down” and (somewhat dirty) part. “Massage” the thick dark dressing into the kale leaves. Yes, your hands will get all gooey and small bits of kale and buckwheat groats will stick to them. But when you’re done, you get to lick them off before you wash them off. Dump the pomegranate seeds on top (and grapes if using), mixing those in with a spoon. If you have golden flax seeds soaking like I usually do (good soluble fiber for those of us of a certain post-menopausal age), drizzle a teaspoon of those over the top and mix in. If at all possible, eat with a silver spoon. You deserve it. I would have never thought to put those flavors together, but now that you have, it looks delicious! Well, Veronica, every once in a while my entrenched eccentricity hits paydirt! LOL I think this might be one of those kind of things. 🙂 Glad you think it looks delicious!! This is some kind of wizard genius craziness you have concocted here, Maria! I am looking forward to trying this out, you are so inventive. I feel better when I eat PBWF, but have a hard time with recipes, especially with salad dressings. Yours sounds pretty simple. Is there sugar in the apricot spread? Thanks, Michele! Nope, no sugar in the spread. I used Simply Fruit brand, but there are others as well. I like to keep my dressings simple–and sugar free when at all possible. I hope you enjoy trying this one out!! What an interesting idea! I am going to try. 🙂 A stupid question…are the buckwheat groats soaked or toasted or? Thanks! Maria, this is absolutely delicious! My new favorite! I’ve made it about 5 times already, until I ran out of kale! I used raw organic cacao powder instead of the carob, and I didn’t use the any vinegar because I didn’t have it. And only pomegranate, no grapes, on top. I’ve been sending this link out to anybody who will remotely listen! BTW “Decadent” was the operative word, the one that stirred me to try it. Thanks for taking time to put this together. I love all your posts. Many blessings to you.